The Rhesus Macaques monkey photographed by McGeorge. Ocala, Florida — Graham McGeorge has spent the last five years photographing a feral colony of Rhesus Macaques, a type of monkey, along the Silver River in Ocala, Florida. But for the past several weeks he has been looking for answers. On February 20, Ocala Post was contacted by Karen Kline from Negotiations Are Over, in reference to a particular monkey McGeorge had been photographing. 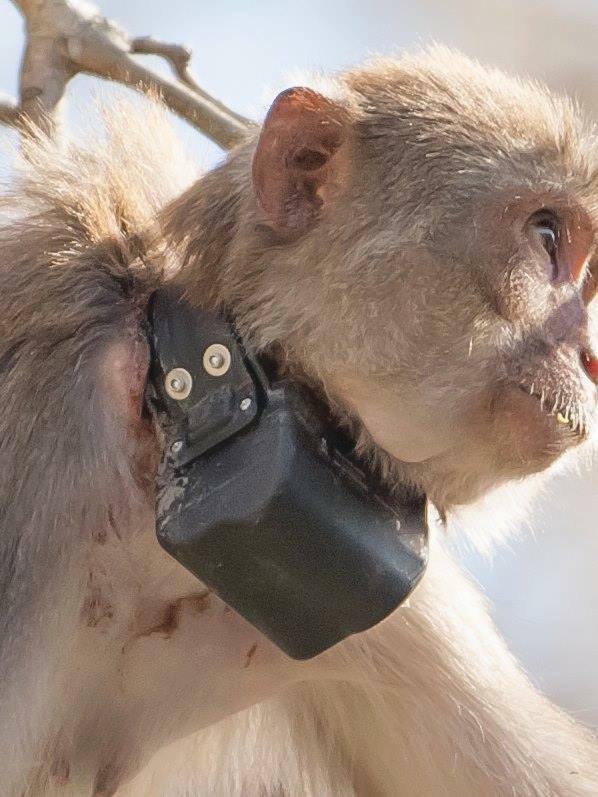 Kline stated that on January 31, 2015, McGeorge had stumbled upon a monkey wearing a GPS collar, which appeared to be constricting the monkey’s neck and rubbing it raw. Concerned for the well-being of the monkey, McGeorge said he immediately contacted Florida Fish and Wildlife Conservation Commission. He was then referred to the University of Florida, because that is who placed the tracker on the monkey. Kline said after contacting UF, she and McGeorge were provided with conflicting information about the monkey. She said that’s when they reached out to Ocala Post. Ocala Post then contacted UF and inquired about the situation. “The University of Florida is studying the habitat use and movement patterns of the Rhesus Macaques in Silver Springs Park. A single macaque was collared in December as part of this study. UF researchers were notified February 2, about the concerns of Mr. McGeorge. The researchers immediately sought advice from their project veterinarian, who recommended the collar be removed. The very next day, UF sent a signal to a satellite, which enabled the collar to fall off the monkey. That process took a few days, but we confirmed that the collar was no longer on the animal on Sunday, February 8. However, McGeorge does not believe that the monkey had only been wearing the collar for approximately two months; he believes it was much longer. He said he wanted proof that the collar had been removed, but alleges that UF refused to supply proof. ” Unfortunately, their past history does not lead one to believe they are a reputable organization,” McGeorge said. McGeorge said he hasn’t seen the monkey since the incident, but will keep looking for answers. Researchers said they will continue to observe the animals in the Silver River area.